Originally titled The Incredible Island, this relatively obscure Bruce Lansbury production aired on Thursdays on NBC in February of 1977 and starred Jared Martin (War of the Worlds [1988-1990]), Ike Eisenmann (Escape from Witch Mountain, Star Trek II: The Wrath of Khan), Roddy McDowall (Planet of the Apes) and the beautiful and enigmatic Katie Saylor. About a group of adventurers lost on an island in the Bermuda Triangle, The Fantastic Journey spawned a whole sub-genre of 1970s American science fiction TV: the sojourn, usually by foot, through alternate civilizations or regimes. Star Trek creator Gene Roddenberry had thrice attempted to launch a similar format in a prime time series, in the post-apocalyptic trio of pilot TV-movies, Genesis II, Planet Earth and Strange New World. None of those efforts made it to series, but The Fantastic Journey did, perhaps because it was more optimistic about man's possible future than Roddenberry's post-nuclear war efforts. Week after week in The Fantastic Journey, a team of protagonists hopped (literally...) from one time zone to the next, encountering bizarre alien civilizations, pirates, the descendents of Atlantis, and even a 20th century funhouse of horrors. The team was in search of a mythical terrain called Evoland, where a device purportedly existed that could send every person back to his appropriate home in time. For such an influential series, however, The Fantastic Journey did not survive long - dying out after only ten hour-long episodes. Perhaps the reasons for its failure had something to do with the rapid cast changes and the uneven tone of the stories. For instance, the first pilot starred Scott Thomas, Ike Eisenmann, Jared Martin, Carl Franklin, Susan Howard and Karen Sommerville. Well, after the first episode, Howard, Sommerville and the lead actor, Thomas, were unceremoniously dumped. Literally half the cast was axed. Then Katie Saylor was added to the cast as Lianna in episode two, "Atlantium" and Roddy McDowall joined up in episode three, "Beyond the Mountain" as Dr. Jonathan Willaway. Then, mysteriously, Saylor's character disappeared after episode eight, not to be seen again before the axe fell. The cumulative effect of this musical chairs routine was a deep sense of inconsistency. In a series with only ten episodes, all the cast changes suggested that the show had no overall plan or vision. It all just felt... a little haphazard. But certainly not uninteresting. Writer Dorothy Fontana recalls "Turnabout," which featured Joan Collins as the leader of a female squad of revolutionaries who turned the tables on a patriarchy. "Well it doesn't necessarily follow that any one gender is better at anything than anyone else," she opens. "It was one of those stories where we wanted to do a traditional Amazon culture without actually doing the real Amazon culture. There are a couple of science fiction stories in which women are in control to begin with, and the men overturn them, and so on. Or the men mess things up in the first place, get thrown out, and now have a matriarchy. Human nature being what it is - power begets power begets corruption begets disaster - that was kind of in my mind. To do a story - and I think it might have been a rewrite - more about human nature than a sexual power play. We were just trying to show that humanity makes the same mistakes over and over again unless it pays attention to its histroy." Had some of these very interesting stories been presented with a greater sense of verisimilitude (i.e. - a bigger budget -) they might have been forgiven for their occasional trespasses. However, "Atlantium" took place in the Bona Venture Hotel, seen also in Buck Rogers in the 25th Century - hardly a futuristic locale, even in the 1970s. And "Funhouse" centered on a contemporary amusement park you could find at any Six Flags venue, To make matters worse, the set designs in "Turnabout," "An Act of Love" and "The Innocent Prey" looked patched together out of spare parts from previous episodes. 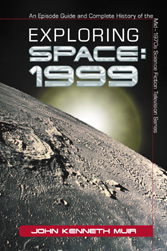 Click on the book cover to the left to order John Kenneth Muir''s analytical study of the 1970s TV series Space:1999. EXPLORING SPACE:1999, from McFarland. 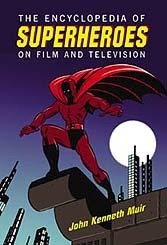 John's Encyclopedia of Superheroes on Film and TV covering everything from Batman to Black Scorpion to Witchblade to Nightman. Order now! In the mid-1970s, an American team of scientists and their families run afoul of a strange green mist while out on their boat exploring the Bermuda Triangle. They pass through the mysterious phenomena only to arrive at an uncharted island. Once there, they encounter a gang of nasty pirates, but are assisted by a peaceful man from the 23rd century named Varian who is also stranded there, and now masquerades as a savage so as not to draw the attention of the pirates. Written by: Kathryn Michaelian Powers. Directed by: Barry Carne. Airdate: February 10, 1977. Scott, Dr. Walter and Varian head to the futuristic city of Atlantium, following up on the trail of Scott's father and the others. When they arrive, they learn that the rest of the team has already departed to their normal time periods. The denizens of Atlantium offer to send Scott and the others home too, but in fact intend to sacrifice their energy to a giant pulsating brain that runs the metropolis. The travelers survive this trap in part with the help of a citizen named Lianna who has telepathic abilities. Written by: Harold Livingston. Directed by: Irving Moore, Airdate: February 17, 1977. The travelers arrive at another province and run into the arrogant Jonathan Willaway, another scientist from the twentieth century (The 1960s) who passed through the Bermuda Triangle and became trapped on the island. Now, Willaway lives in a society of humanoid androids, battles with green-skinned extra-terrestrials who live in the hills, and has hopes of marrying Lianna. When things fall apart for Willaway, he joins up with the other travelers. 4. "Children of the Gods"
Written by: Leonard Katzmann,. Directed by: Alf Kjellin. Airdate: February 24, 1977. Young Scott will have to fight the youthful warriors of another province if he hopes to save his friends. 5. "A Dream of Conquest"
Written by: Michael Michaelian. Directed by: Vincent McEveety. Airdate: March 17, 1977. An alien warlord plans to march across the Provinces with his army, unless stopped by Willaway, Varian and the others. 6. "An Act of Love"
Written by: Richard Fielder. Directed by: Virgil Vogel. Airdate: March 24, 1977. Written by: Michael Michaelian. Directed by: Art Fisher. Airdate: March 31, 1977. A malevolent wizard with diabolical plans to possess Willaway separates and traps the unfortunate travelers in a frightening 20th century funhouse/house of horrors/carnival. Written by: Dorothy Fontana and Ken Kolb. Directed by: Victor French. Airdate: April 7, 1977. A group of dissatisfied women launch an insurrection against the males in their province, using a device to vanquish them all to a nether realm. The travelers arrive in the province and attempt to bring equality and balance to this war of the sexes. The travelers cross into another province and spend an eerie night with a married couple in their odd house filled with antiques. Written by: Nicholas Corea. Directed by: Vincent McEveety. Airdate: June 16, 1977. A transport spacecraft from the future is caught in the Bermuda Triangle and becomes trapped on the island. Two ruthless convicts have replaced the crew and lie to Varian and the others about it. Soon, they attempt to exploit a community of peaceful people. Each Fantastic Journey story fell into the same repetitive formula. The travelers arrived in a new time zone and were captured by villains, most of whom were dictatorial tyrants. The travelers then escaped and toppled the corrupt regime. This was the story layout of "Children of the Gods," "Atlantium," "Beyond the Mountain," "An Act of Love," "A Dream of Conquest," and "Turnabout." Perhaps more interesting was the presentation overall than the individual stories was the notion that the dramatis personae were part of a family dynamic. This would seem contrary to the format of the series - which would have seen the characters separate should they find EvoLand. "Well, you could say that when they reached their goal, they would go different ways," Fontana considers. "But they had to be a team while they were pursuing that goal of finding a way to get home. To each his own, right? But I thought it worked very well, actually. People thrown together by necessity or inclination to solve a problem are always very interesting." The leader, or father-figure, of the makeshift group was Varian, an evolved man from a perfect twenty-third century. As played by Jared Martin, Varian was serene, untroubled, and a committed pacifist. In other words, he was the perfect television father. He was patient, supportive and he always maintained the self-esteem of those he interacted with, a Mr. Brady of the sci-fi set. "The difference between Varian and the people from the present was never sufficiently examined. He was just supposed to be somehow better, he knew more," actor Jared Martin told interviewer David Houston in Starlog # 9 in October, 1977, "Varian lacked humor, was a little stiff, but he was closer to God than the rest of us. (1)." "I liked Jared very much," recalls Fontana. "I think all the characters had an opportunity to have 'their' story." 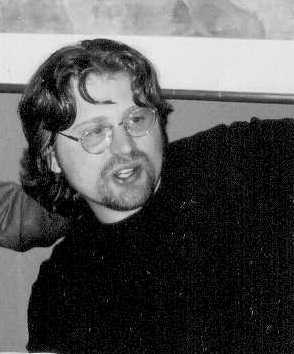 The child of the family was Scott Jordan (Eisenmann). He was the group's moral compass and the surrogate for the audience, since he hailed from our present. It was Scott who objected to leaving behind a character named Sigma in "Children of the Gods" and who insisted on returning to aid Varian in "An Act of Love." Scott was the typical, middle-class American kid. Smart as a whip, well-educated and with a firm sense of right and wrong. Carl Franklin's Dr. Walters was the impulsive and athletic older brother, always jumping into the good fight with gusto and remaining loyal to the family. McDowall's Dr. Willaway, the rascal of the bunch, was more realistic than Lost in Space's Dr. Smith, but just as adept at finding trouble. Remarkably, for American television in the 1970s, this diverse family of characters found issue not just with the guest villains, but with each other. Willaway wanted to marry the lovely Lianna, but she rejected him. Scott was threatened emotionally in "An Act of Love" when his surrogate father Varian, expressed love for a woman, Gwyneth. And Fred Walters and Dr. Willaway, like Spock and Bones on Star Trek, were always at each other's throats, expressing doubts about each other's trustworthiness. The last family member was the cat, Sil-El. It was a daring and original move to include a cat as a regular character, but various episode directors did not do a good job of remembering to include the feline in their compositions. Sil-El frequently disappeared in and out of scenes, including the climax of many shows. This deficit left attentive cat-lovers to ask with worry, -- what happened to the cat? "It wasn't just one cat, it was several cats," story editor Dorothy Fontana remembers of this unique character. "I remember in one episode we had a loud shot fired and our main cat jumped up in the rafters. It took about an hour to coax this cat down..."
The Fantastic Journey deserves some credit for maintaining a (very small) degree of story continuity, which was rare for the era. Various episodes referrred to Scott's ditched father, lost after "Vortex," and the main characters on the show recalled previous adventures in "A Dream of Conquest" and "An Act of Love." That kind of consistency provided the brief journey with a sense of history. With the cast changes, it was appreciated. Looking back at the series today The Fantastic Journey certainly had great potential. D.C. Fontana was the story editor and she has always been one of science fiction television's shining stars. Her Star Trek story "This Side of Paradise" remains this author's favorite Star Trek, and one of the finest hours of genre television, period. Additionally, the entire Fantastic Journey cast was quite good. In their brief time together, Saylor, Eisenmann, Martin, Franklin and McDowall created memorable characters. As for the format, it was clearly a workable once, since it has been repeated so many times. The Fantastic Journey pilot shot at Franklin Canyon and Bronson Caves in 1976 and starred Ian McShane of Lovejoy as an evil 18th century pirate antagonist. NBC didn't like the opening show, which resulted in the cast changes, and thus passed an edict that all future shows would involve only the future, not the past (hence, no more pirates...). "We had very short prep time," story editor Dorothy Fontana told this author during an interview in2001. "The pilot was sold in November and we had to be on the air the following January. It was a race to get scripts ready that we could shoot, and get rolling, and actually have a show to put on the air by January. Adding to the problem, there were many cast changes from the pilot. The parents of the boy [Ike Eisenmann] were written out of the format, and we had a woman character, Lianna [Katie Saylor] in the second story ["Atlantium"]. "Roddy McDowell came along in the third episode, actually, ["Beyond the Mountain,'] Fontana notes. In that case, I had rewritten that episode, and my job was to create a character that would attract Roddy McDowall to him. And then we liked Willoway so much that we wanted to continue him in further shows. He liked the character too, and became a regular. You know, that show also featured Carl Franklin as Dr. Fred Walters, and he went on to become a very prominent and excellent director in the business. He directed One False Move (1993) and Devil in a Blue Dress (1995) and other things. He was just an actor on our series, but he did a great job." And does Fontana have any thoughts on the format for Fantastic Journey - the search for Evoland? "We had a map of the island, which we called Evoland. It was divided into districts that the characters would journey through before finally getting off the island," the scribe reveals. "So each segment would represent a different culture to encounter, but there was always a definite goal: they were headed in the right direction, and that was always on our mind. I think it was a show with great potential, but we were writing episodes under very high-pressure conditions. We were in just such a rush to get the scripts done." "We were so rushed, doing re-writes, settling in, and trying to figure out who the characters were," she describes. "After about the sixth show, we knew where we were going and were ready to run with it," Fontana continues. "Of course, at that point we started getting pre-empted, and the network started doing all those things networks do when they want to get rid of a show." 1. David Houston. Starlog # 9: "Jared Martin: "It failed by trying to stay on the air..." October 1977, page 57. (Article pages 58).